Most are aware that Kluge folder gluers are modular built with maximum versatility for the ever changing world of print finishing and packaging. With the Fold Hook Kit configured on our folder gluers, users can expand the inline converting capabilities to Auto-Lock Bottom Boxes, Tuck-Top Boxes and comparable products. The Kluge Fold Hook Kit is mounted to the crossbar at the converting area and is used to create the cross-fold at the bottom of the box leaving this edge raised for completing the auto-lock bottom. Rated at speeds of up to 5,000 + pieces per hour the Fold Hook Kit can be used to convert applications such as hardware boxes, cosmetic packaging and other specialty packaging products. 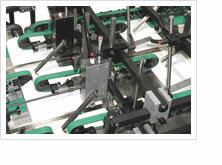 Presently the Fold Hook Kit is available for the OmniFold, ComFold and Small Box automatic folder gluers. 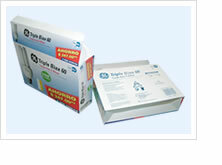 Contact us today to order your Fold Hook Kit and expand your packaging and converting capabilities. Watch a video demonstration of the Fold Hook Kit in action online and learn more about our complete line of folding and gluing equipment.